The mere thought of oils, vinegars, butters, and salts infused with the essence of savory herbs is enough to make the taste buds swoon. Simple to concoct, these preparations are eminently useful for creating flavorful dressings, marinades, rubs, beverages, vinaigrettes, sauces, and so much more. When packaged into pretty glass bottles or jars with a label, they make a perfect gift that anyone is sure to enjoy. Just imagine giving a basket filled with herbal infused provisions for the holidays, or adorning your table with gorgeous bottles of infused vinegars, oils, herbal butters, and flavorful salts. What fun! 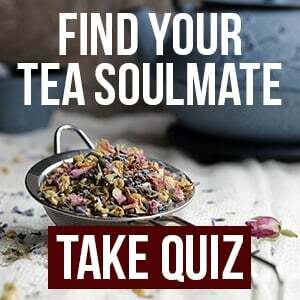 Almost any aromatic or flavorful organic herb can be used when making infusions. Allspice, Anise, Basil, Caraway seeds, Cardamom, Cayenne, Celery seeds, Chili Peppers, Chives, Chive blossoms, Cilantro, Cinnamon, Cloves, Coriander, Cumin, Dill, Fennel seeds, Garlic, Ginger root, Lavender flowers, Lemon Balm, Lemon peel , Lemon Verbena, Marjoram, Mustard seeds, Nasturtiums, Onion, Orange peel, Oregano, Parsley, Peppercorns, Peppermint, Rose petals, Rosemary, Summer or Winter Savory, Tarragon, or Thyme. When vinegar is infused with herbs, it adds a special twist to salad dressings, marinades, dipping sauces, vinaigrettes, and any other recipe utilizing vinegar. Vinegar: Distilled white vinegar, apple cider vinegar, wine vinegar, or rice vinegar. Use milder vinegars when infusing delicate herbs and stronger flavored vinegars for robust herbs. Organic herbs, fresh or dried (see list above). Start by sanitizing a glass bottle or jar (see instructions below). Wash fresh herbs and pat dry (omit this step if using dried herbs). Place the herbs or spices into the sterilized glass container and fill with vinegar of your choice. 3 TBSP dried herbs/spices or 3-4 sprigs of fresh herbs per pint of vinegar is usually a good amount. However, this depends upon the strength of the herb, spice, and vinegar used, so experiment with more or less. Cover the container tightly with a non-corrodible, nonmetallic lid, and place in a dark, cool place to steep. Allow the vinegar to infuse for 2-4 weeks, or until the desired flavor has developed. Once finished, strain the herbs out, and pour the infused vinegar into sterilized bottles or jars. Fresh sprigs of herbs, dried herbs, whole chili peppers, peppercorns, and berries can be added before sealing to make the bottle more attractive and to further enhance the flavor. Label with the ingredients and date, and you’re finished! It’s best to keep vinegars stored in a cool, dark place and use within 4-6 months or keep the vinegar refrigerated to retain the flavors longer. If you notice mold, cloudiness, signs of fermentation, or anything else that looks unusual, discard immediately. For more information about making infused vinegar, this informational sheet from the Oregon State University Extension Service is wonderful. Herbal infused oils are so versatile! They are perfect for stir-fries, sautés, pasta dishes, salad dressings, marinades, roasted vegetables, dipping, and so much more. 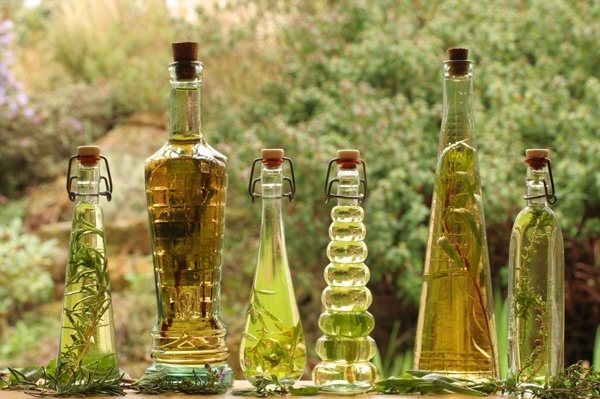 Organic oils: Olive, Macadamia Nut, Sesame, or other culinary oil of your choice. Organic herbs, dried (see list above). Make sure to use dried herbs when infusing oil, as the water content naturally present in fresh herbs can cause botulism. Start by sanitizing a glass bottle or jar (see instructions below) and allow to air-dry completely. Just one drop of water can cause your oil to go rancid quickly. There are two methods that can be used to infuse the oil: cool or hot. For a cool preparation, fill sterilized bottles ¼ of the way with dried organic herbs or spices and then top with oil. Allow the oil to infuse for 2-4 weeks, or until the desired flavor has developed. Oil infused utilizing the hot method can be used right away. For a hot preparation, heat the oil to 180 degrees, turn off the heat, and add spices or herbs while the oil is still hot. Once cool, the herbs can either be strained out or left in the oil for a stronger flavor. When finished, pour the infused oil into sterilized bottles or jars. Dried herbs and spices can be added before sealing to make the bottle more attractive and to further enhance the flavor. Label with the ingredients and date. 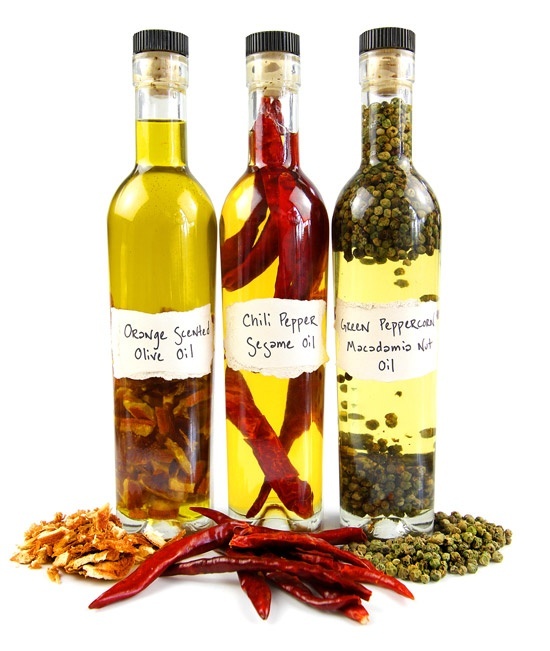 Store infused oils in the refrigerator once ready and be sure to use within 1-3 months. Infusing herbs into butter only takes a few minutes, but it is so tasty. Herbal butters are decadent on steamed vegetables, warm dinner rolls, grilled fish, baked potatoes, pasta dishes, or when incorporated into sautés and sauces. 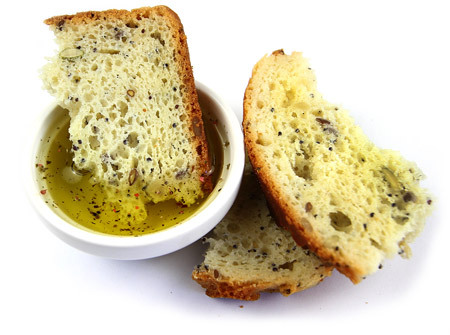 Rosemary and garlic butter atop warm, crusty homemade bread? Yes, please! Herbal infused butters are so easy and delicious to make. Simply place the butter in a bowl, allow it to soften, add dried herbs or spices, and blend together. If using fresh herbs, chop and then blend with the butter. The amount used will depend on how flavorful the herbs are, but a typical amount is 2-4 Tbsp of fresh herbs or 1 Tbsp dried herbs per ½ cup (1 stick) of butter. The butter will taste delicious right away, but will improve if the flavors are allowed to develop for 24 hours in the refrigerator before using. Store extra herb butter in the refrigerator or freezer. Herbal infused salts are a fun way to turn ordinary ingredients into something special! This versatile ingredient is absolutely delightful in soups, sauces, stews, roasted vegetables or meats, and as a finishing touch to any dish. Sprinkle savory Rosemary salt over homemade bread, Thyme salt on a bowl of steaming homemade stew, Sage infused salt on roasted root vegetables, or enjoy a margarita dressed up with a Chili Pepper salt rim. Yum! Sea salt (coarse or fine). Organic herbs, dried (see list above). Use 1 part herb or spice to 4 parts salt. Crush the herbs in a mortar and pestle or whirl in a food processor or coffee grinder. Mix the herbs with salt. When using hard herbs and spices like Cinnamon sticks, Cardamom pods, or Star Anise, simply place into salt and allow to infuse for 2-4 weeks, then remove the herbs and spices. The salt will be infused with the delectable flavor and aroma of the herb. Package in pretty, airtight glass bottles, jars, or tins. Add labels and a bit of decorative ribbon or twine if desired. For a creative presentation, you can layer each herb separately into the jar, with instructions to mix the herbs together before using. To easily transform these into a memorable gift package, create a set of flavored salts and include recipe ideas, or pair the salts with jars of whole pink, green, white, smoked, or rainbow peppercorns. Sanitizing glass containers: Wash bottles or jars thoroughly in warm, soapy water. Place glass containers in a pot of hot water, bring to a boil, and gently boil for 10 minutes. Remove from boiling water and place inverted jars on a clean towel to dry. Information sheet from Oregon State University Extension Service.